Comments: Emmet Cahill is a fantastic addition to the group. He does great on the group song "Galway Girl." He also shows he's up to the challenge of joining the successful group with his solo "Kindred Spirit," which Phil Coulter wrote for him. Emmet brings tears to my eyes with the emotion in his singing. While Paul will be missed as part of the group, Emmet is up to the task of taking over. I look forward to more from all of these amazing men. Comments: Love Galway Girl!!! It sounds like they're sitting in a pub, singing to their hearts content. Fun stuff. Comments: Nice write up DiMaSt. I am really impressed with this band. I didn't mean to talk over you in the other thread sorry. I tend to get excited easy. lol....Neil tells a wonderful story about the song doesn't he? Thanks for posting this. ""Lots of you have been asking about this beautiful song I sing as part of the live show. Here is the story behind Noirin, mo Stoirin  Noreen. Noirin, mo Stoirin started life as an instrumental piece which Phil Coulter composed as a wedding gift for his friends Liam Neeson and his wife Natasha. Phil called the tune Natasha and performed it, for the very first time at the ceremony at Liams farm in upstate New York. One other memorable performance was when he played Carnegie Hall a few years later with Liam and Natasha in the audience. She was delighted, excited like a kid. The tune kept rolling around in Phils head and he kept telling himself that he ought to write a lyric and turn it into a song but could never get a handle on it and kept putting it on the back burner. Natashas untimely death was an enormous shock to all of us, such a tragedy, such a waste of a young wife and mother. Such a loss. Phil started thinking again about the tune but decided NOT to write a lyric that would specifically refer to Natasha but rather try and capture the sense of missing a loved one with every bone in my body. In Phils words, it was one of the most difficult writing jobs Ive done in a very long time. Comments: Thanks for sharing that. I will be looking forward to hearing the new member. Comments: I've been waiting for this album!! The Heritage songs were part of the show last fall, when Celtic Thunder toured the U.S. Love the guys voices in the solos, but the harmonies are just....the best. It's hard to pick favorites, but Whiskey in the Jar (with Keith and Neil) is definitely one of them! And it's the first chance for fans to hear the voice of Emmet Cahill, "the new guy", in his role with Celtic Thunder. Sit back and enjoy, there is something for everyone on this album. 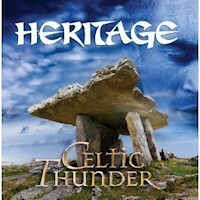 Want to write a review about Celtic Thunder's Heritage album? Post your comments in this box to be displayed in our community forums and in our album database! Please make sure you are logged in before proceeding. Please login to write your comments about Heritage.